Barton Rovers and Daventry Town. 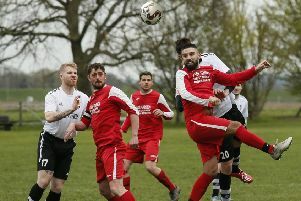 Barton Rovers extended their recent good form with a single goal victory at a bitterly cold Sharpenhoe Road on Saturday. The hosts were without club captain Paul Andrews who is sidelined with a shoulder injury apart from that a fully fit squad were available to managers Rich Wilmot and Wes Byrne. Daventry were the sharpest out of the blocks and took the game to Barton early on, Thomas Berwick in particular proving a handfu. Rovers’ first chance should have put them ahead. A great through ball found Kim Forsythe in space and one on one with the keeper, but his shot was smothered when he could have squared. But on 19 minutesConnor Vincent delivered a pin point cross to Keshi Anderson who made no mistake. Daventry showed no sign of the disarray that has forced them into new management as they battled for every ball, James Weale denied by Kyle Forster’s legs. The fast pace continued in the second half. Joe Reynolds’ 25 yard effort was comfortably saved. Anderson should have extended Rovers’ lead but Heath pulled off a great save. Manager Rich Wilmot said: “We dug deep and deserved the three points. Daventry were a tough opposition, a much stronger side than us but we played some great football. Rovers visit Godalming on Saturday and go to North Greenford on Tuesday.